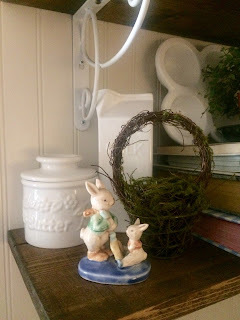 As promised, I'm here to share a few photos of the spring decor in my kitchen. Before I do though, aren't these lilies gorgeous? They are from my Mama's lily and it is supposed to freeze here tonight so I went over and cut them so they could be enjoyed for a few more days since she is out of town. Now...on to the kitchen. I didn't add too much...just a few things to bring a spring feel to the room. My shelves are a favorite place to decorate for the seasons. Here are the ones to the right of the sink. I have two of these pretty metal eggs. They open to put candy or treats inside but I just love them for the scenes on them. Cute little salt and pepper shakers I picked up at Cracker Barrel a few years ago. A sweet little thrifted figurine and a little moss covered basket complete these shelves. Here are the shelves to the left of the sink. 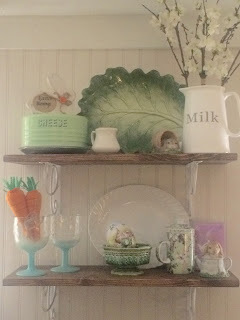 I added a thrifted lettuce leaf platter to the top shelf, along with a couple bunnies. This wooden bunny was one of my few purchases this year. He is so simple and cute! The felt carrots are another new purchase from the Target Dollar Spot. They were $3. A few weeks ago, I picked up these dogwood branches at Michael's for my milk pitcher. 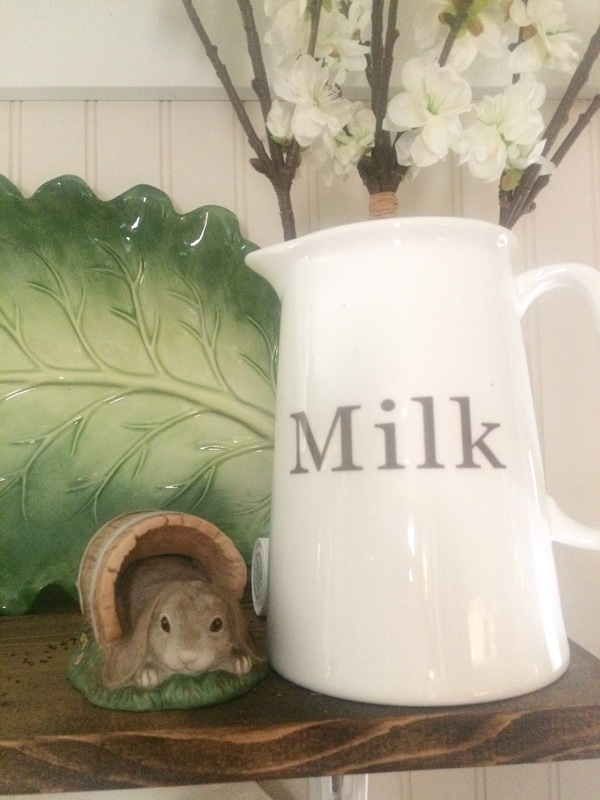 This sweet little bunny was thrifted a few years ago. As was this one. They are both Home Interior figurines. 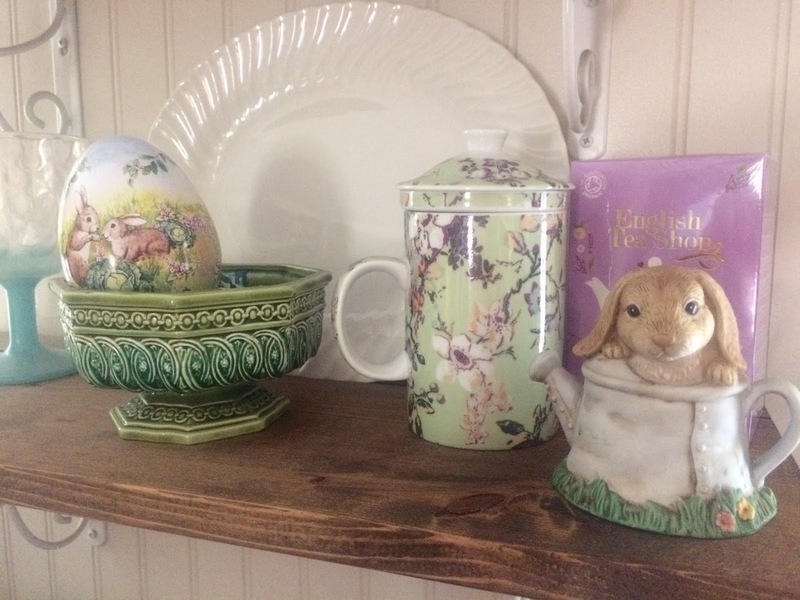 The other metal egg is in the green pedestal dish. The tea mug and box of tea were a Christmas gift from my sister. Their colors are perfect for spring. 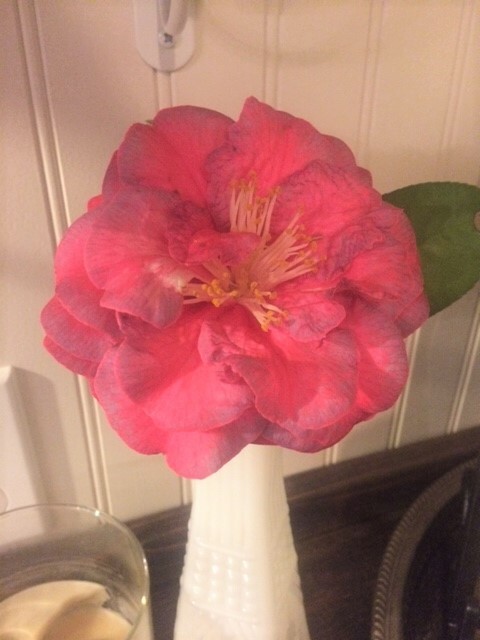 I picked some camellias today and filled a vase and the pink bowl with them. 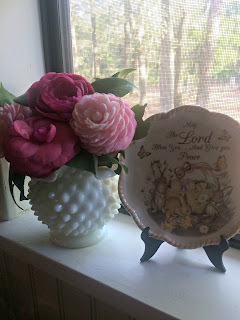 I just love this sweet little thrifted pink bowl I picked up a few years ago. A sweet little bunny plate sits beside the vase of camellias. The last camellia is one of my favorites with the blue tinted edges. This one looks a little rough but it is still pretty. 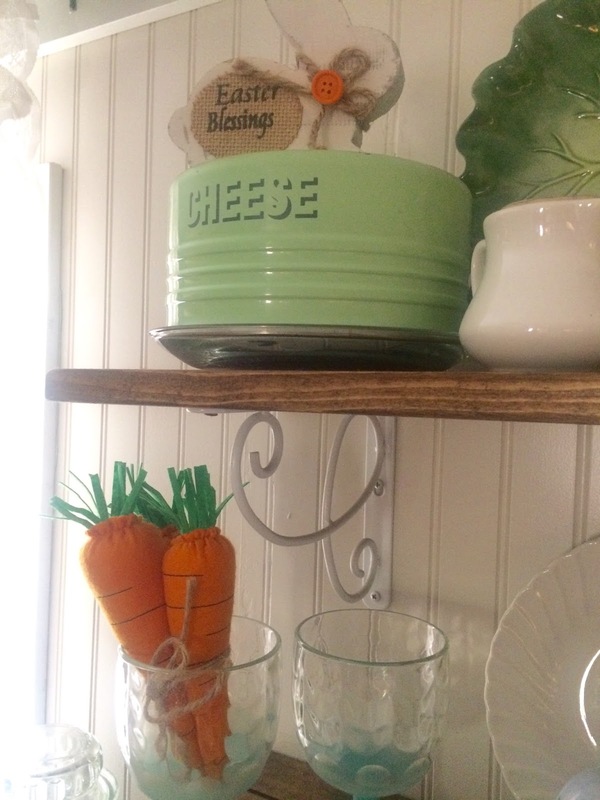 The other side of the kitchen doesn't have any spring decor. I did move the coffee station to this side and did a little rearranging. The crock pot doesn't normally sit on the counter but I used it yesterday to cook a pork loin. I really love my under cabinet lights. They help so much! Our home is not very bright since we live in the woods. I would love more natural light but I love the woods that surround us more so I just accept that we don't get much natural light in the house. And, that's all I have to share for now. I don't do much decorating for the seasons, but I do like to add a few touches here and there. 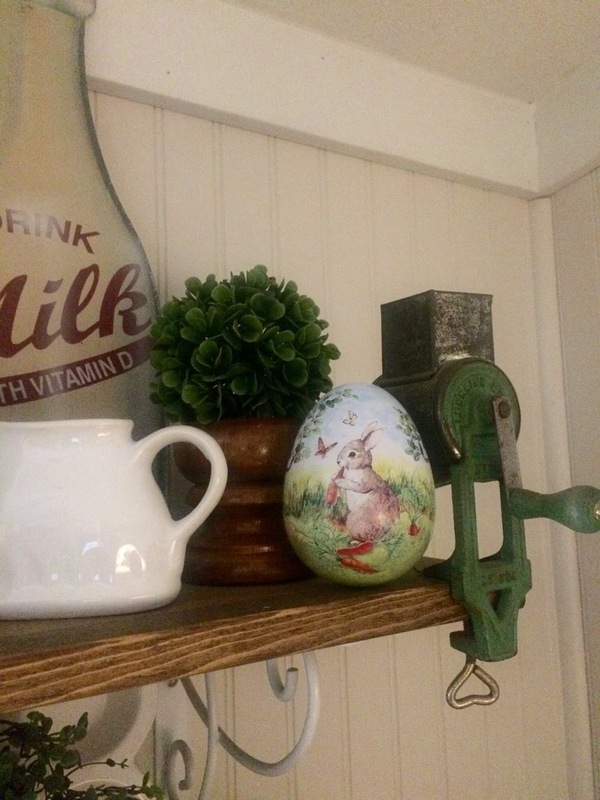 Have you done any spring/Easter decorating? I hope your week is going well. My spring break is going way too fast...it always does. But, I am going to enjoy these last four days. Hopefully I will be back to share another post before Monday. Looks very pretty and springy...love you! 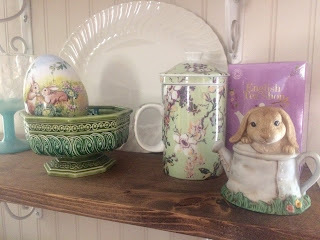 Your spring kitchen looks so pretty. All of your pieces work so well together. You have a great talent for decorating. I'm still in love with the kitchen reno. I love the little touches! I think that's what I'll try to do in my decorating now, well except for Christmas which is all out for sure! I know you enjoyed Spring Break! Vicky your kitchen is amazing! 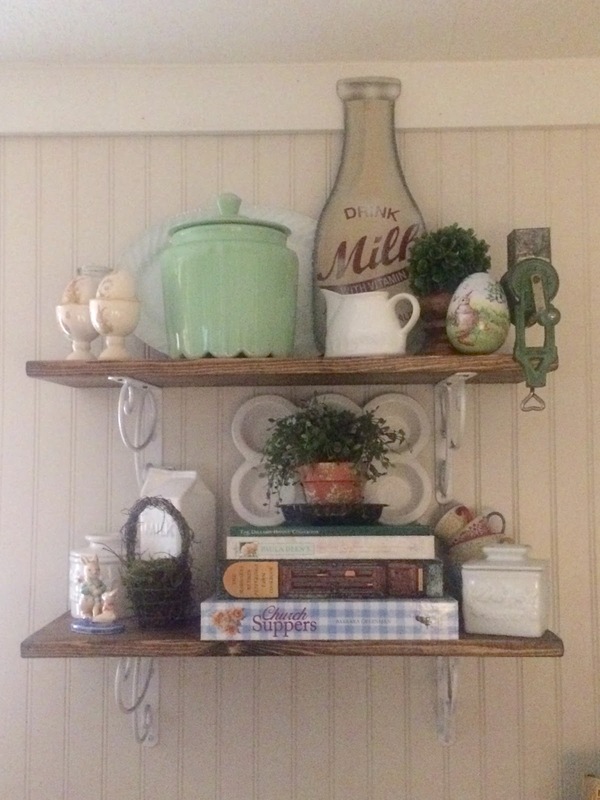 I love all the things on your shelves and all the green accents . . . simply beautiful. That grinder is wonderful as well as the Milk pitcher, the cabbage platter and the cheese bowl . 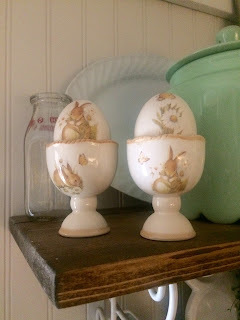 . . oh, and the egg cup salt and pepper . . . these photos would be perfect for Country Living magazine. White kitchens are my very favorite, so clean and fresh:) You did a great job with your remodel. Enjoy! I love all of your little vignettes. 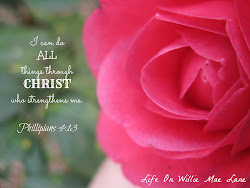 The camellias in the kitchen window are so pretty. The kitchen looks great. Your sweet pieces are just enough to give your kitchen a Spring feel. I did want to bring the bunnies out by now but the 3 feet of snow we got just didn't make it feel right! The dogwood in the pitcher definitely says Spring! The green cheese platter and cover is so cute, is it made of metal?